Forum member Wes J. 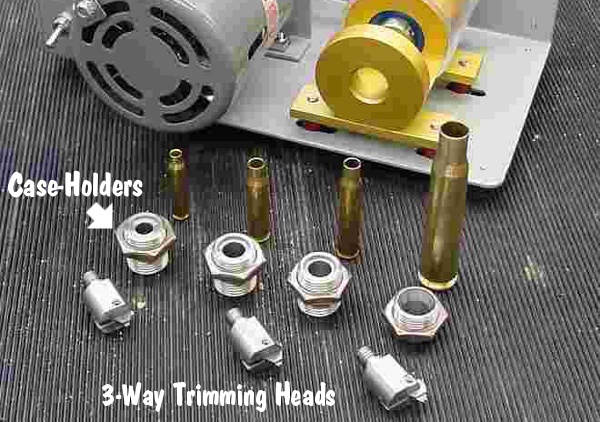 (aka P1ZombieKiller) has produced a helpful video showing how to form Dasher cases use the Hornady Hydraulic forming die kit. This includes a two-part die (body and piston), and a special shell holder. To form the case, you insert a primer in your virgin brass, top the case off with with a fluid (water or alcohol), then run the case up into the Hydro-forming die. A few stout whacks with a hammer and your case is 95% formed. 1. Insert spent primer in new 6mmBR brass case. 2. Fill with water or alcohol (Wes prefers alcohol). 3. Wipe excess fluid off case. 4. 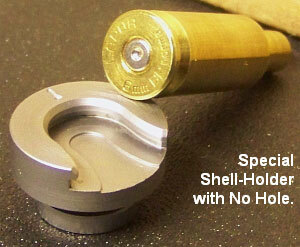 Place case in special Hornady shell-holder (no primer hole). 5. Run case up into Hydraulic forming die. 6. Smack top piston of forming die 3-4 times with rubber mallet or dead-blow hammer. 7. Inspect case, re-fill and repeat if necessary. 8. Drain alcohol (or water) into container. 9. Remove primer (and save for re-use). 10. Blow-dry formed case. Inspect and measure formed case. Wes achieves very uniform cartridge OALs with this method. He measured ten (10) hydro-formed 6 Dasher cases and got these results: two @ 1.536″; 2 @ 1.537″; and 6 @ 1.538″. 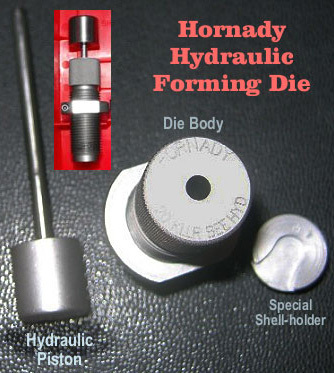 With a Hornady hydro-forming die, hydraulic pressure does the job of blowing out the shoulders of your improved case. The process is relatively simple. Place a spent primer in the bottom of a new piece of brass. Fill the case with water, and then slip it into a special Hornady shell-holder with no hole in the middle. Then you run the case up into the forming die. Now comes the fun part. You gently insert a plunger (hydraulic ram) from the top, and give it three or four stiff whacks with a mallet (or better yet, a dead-blow hammer). Remove the plunger and you have a 95% formed case, ready to load. Hornady supplies a shell holder made specifically for the hydro die; there’s no hole in the bottom of it. Just insert a spent primer into the primer pocket and you’re ready to go. The spent primer, combined with the solid shell holder, keeps the water from seeping out of the primer pocket. The primer pushes out a little bit during this process, but it’s impossible for it to come out because of the way the shell holder is designed. The shell holder has a grove which allows the case to slide out of the shell holder even when the primer protrudes a bit. Story tip from Body Allen. We welcome reader submissions. 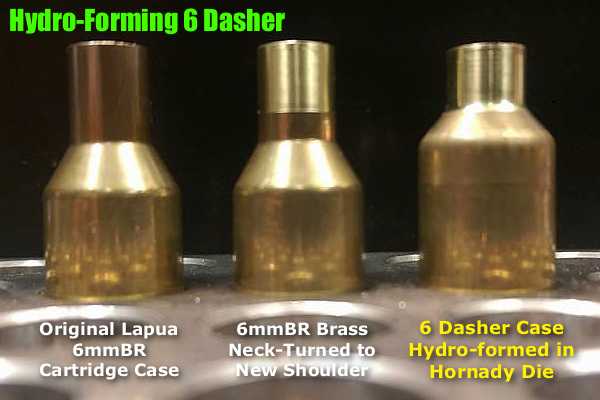 Share the post "How to Hydro-Form Cartridge Brass — Dasher Video"
The shooting season is now in full swing. When you head to the range you’ll want to be prepared. That means collecting all the gear you’ll need at the range. It’s easy to forget small, critical items, so we’ve provided a checklist of the small “extras” you should pack before you head out to the range. In addition to rifle, rests, ammo, targets, and cleaning gear, here are a dozen essentials you should include in your range bag. • Shell-Holder — If you don’t have calipers, you can use a shell-holder to check for excessive case expansion from hot loads. If a fired case doesn’t slip into the shell-holder easily, your load is definitely TOO HOT. • Extra Earplugs — Always use ear protection when shooting. We bring a 35mm film canister with extra sets of foam earplugs. • Hex Wrench or Screwdriver for action screws — Action screws can work loose with time. Always bring the appropriate hex wrench or screwdriver whenever you go to the range. • Small Wrench for Scope Rings — Check the tension of your scope base and ring fasteners before you go. 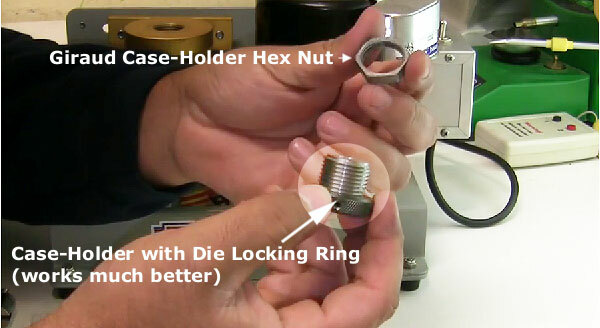 Bring along a small Torx wrench for the ring screws (or other tool that fits your fasteners). • Normal and Under-sized Jags — It is often wise to use one-caliber undersize jags when applying solvent with cotton patches. You should have a couple sizes in your range kit. • Extra Batteries — Bring extra batteries for all your electronic gear — which can include chronograph, windmeter, digital camera, GPS etc. • Small Notebook and Pen or Pencil — Use the notebook to record chron data, log group sizes, and make notes about wind and weather conditions. • Adhesive dots — Bring a few sheets of adhesive dots (sold at office supply stores). Use small white or black dots as target pasters. Use larger red or orange dots as aiming points (target centers). • Folding Chair or Camp Stool — This comes in handy if you’re spotting for another shooter, or if you reload away from the firing line. • Water Bottle — You can’t shoot well if you’re dehydrated. Bring at least two quarts of water with you and keep a bottle at the bench. • Surveyors’ Tape and Wood Stakes — You can make inexpensive wind indicators using surveyors’ tape attached to the top of wood stakes. • Small Plastic Ruler — Use this to measure your group sizes. A transparent (see-through) ruler works best. Rulers are also useful for drawing lines on targets. This list is not intended to be exclusive. There are many other items you may wish to include. Obviously bring safety glasses, and Sharpie-type pens are always handy to mark targets. We invite our readers to add other “essentials” to the list. The important thing is to plan ahead, packing your key items before you drive to the range. 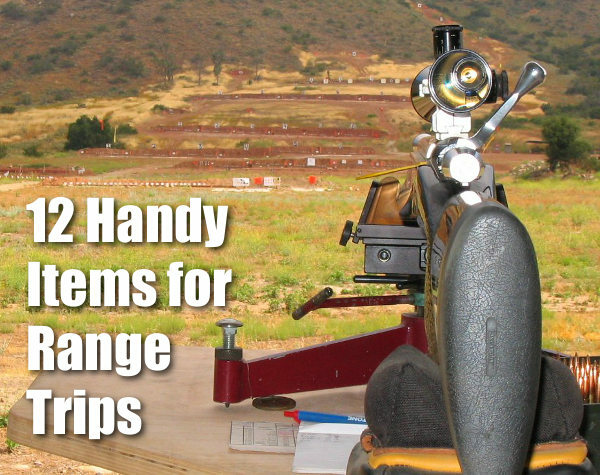 Share the post "A Dozen Handy Items to Pack in Your Range Kit"
1. I was surprised by the low effort needed to prime cases — it’s pretty amazing. 2. You can quickly and easily install shellholders and change primer sizes. 3. The folding primer tray works very well. It’s a great setup from my testing so far. Are there any negatives with the tool? Gavin noted that, in the course of loading 100+ rounds, once or twice he had to tap the triangular tray to get the primer to feed: “That’s not a big deal, and may smooth out with time”. 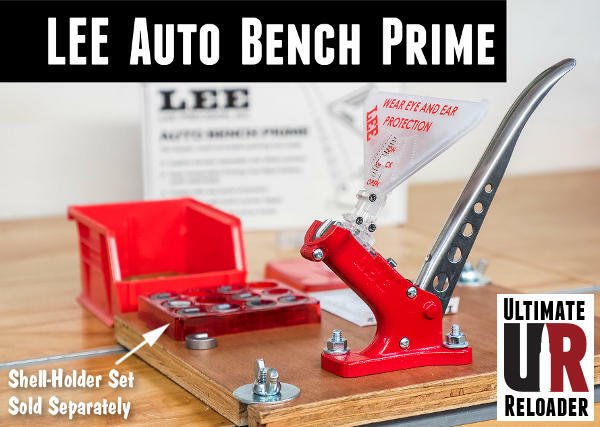 Available at Grafs.com for just $28.59, the Lee Auto Bench Prime tool is very affordable. It costs much less than competitive bench-mounted priming tools from Forster and RCBS. NOTE: this tool requires dedicated Auto Prime shell holders (sold separately), but that’s a relatively small added expense. 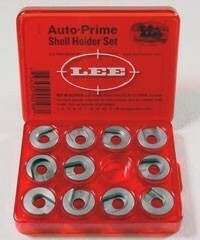 A set of Lee shell-holders (shown at right) costs less than $20.00 (street price). 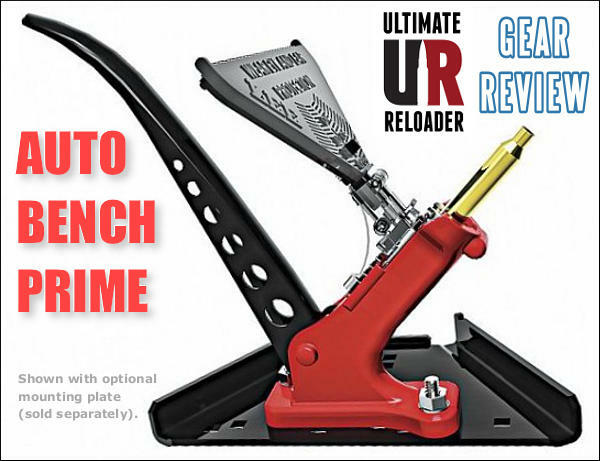 Share the post "Ultimate Reloader Reviews the Lee Auto Bench Prime"
Forum member Erik Cortina recently launched his own YouTube Channel dedicated to precision reloading and accurizing. Erik’s videos demonstrate the proper use of specialized reloading tools and provide helpful hints. Erik’s latest video is about the “mother of all brass trimmers”, the Giraud powered case trimmer. 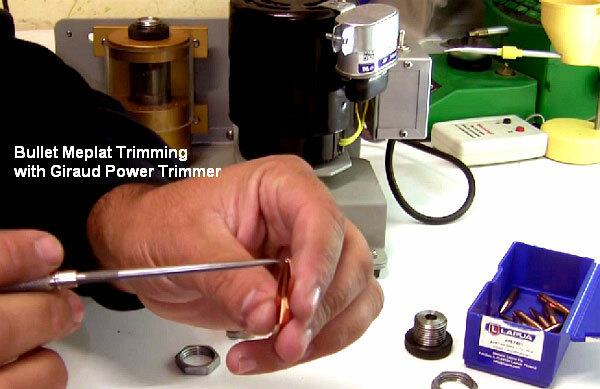 Erik says: “It you do volume reloading… this is the only trimmer to get. It not only trims to length but it also chamfers your case mouth inside and out.” In his video, Erik offers some very clever and useful tips that will help you get the most from your Giraud. The Giraud trimmer is very precise. When set up correctly, it can trim brass with amazing consistency. In the video, Erik trims 5 pieces of brass in 15 seconds (6:32 mark). He then measures all five with precision calipers (7:00-8:08). All lengths are exact within .0005 (half a thousandth). Erik notes that the Giraud trimmer indexes off the case shoulder. As long as you have fire-formed brass with consistent base-to-shoulder dimensions, you should get very consistent trim lengths. The secret to the system is a 3-way cutting head. This cutter can be swapped in and out in a couple minutes with wrenches provided with the kit. Erik has three different heads; one each for 6.5mm, 7mm, and .30 caliber. 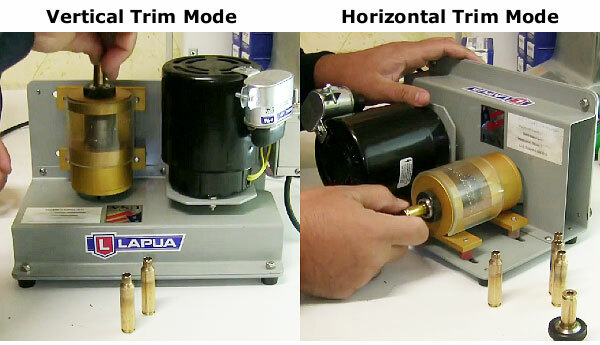 The video shows how to adjust the cutting heads to match caliber diameter (and to get the desired amount of inside/outside chamfer). This is a manufacturer’s photo showing an older model. The Giraud can be used in either horizontal or vertical modes. Erik prefers to have the trimmer aligned vertically, allowing him to push cases down on the trimmer head. But the trimming unit has twin sets of rubber feet, allowing horizontal or vertical orientation. For his .284 Shehane, Erik had to create his own case-holder (Giraud does not make one for that wildcat cartridge). Erik used his chamber reamer. To his surprise, Erik found that the brass was easier to trim in the custom case holder (compared to the Giraud-made spring-loaded holders). With a perfect fit, trimming and case extraction went more smoothly and the process was easier on his hands. (See 9:00-10:00). Based on Erik’s experience, you may want to create your own custom case-holder. 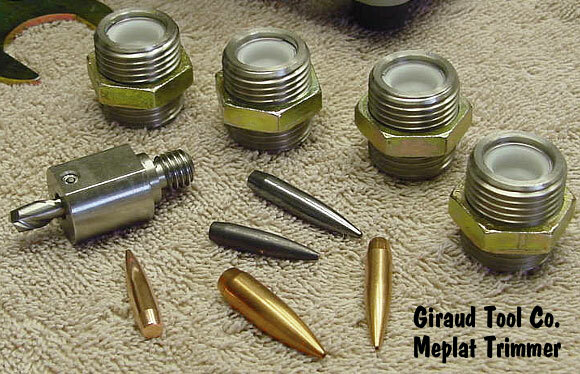 With a special bullet-holder fitting and meplat cutter head, the Giraud power trimmer can be used to trim bullet meplats. Trimming meplats can help make the Ballistic Coefficents of a batch of bullets more consistent. Uniforming meplats is also often done as a first step in the process of “tipping” bullets to improve BC. Share the post "Using the Giraud Power Trimmer — Smart Video from Erik Cortina"